Wide fairway, aim at bunker and let it go. Be sure to use enough club on second shot to clear greenside bunker. Keep right off of tee. Beware of large bunker in the middle of the fairway. Longer players may want to use fairway wood or long iron off of the tee; that should leave you with a short iron for 2nd shot. Hit it over bunkers; you should have a good chance to make par. Big drives may cut corner, but you need two big swings to get home in two. Good Luck! The fifth hole offers a wide fairway, let one fly here. Take advantage of the small flat green. Fairway wood or long iron will leave you in good shape off of the tee. 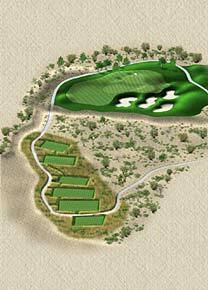 Make sure you do not hit it too far into arroyo that crosses the fairway. Stay right with your approach shot into green. Long, long, long. Let it all out here! You will need three big swings to get on in three. Stay left on 2nd shot if you cannot cross arroyo. Aim at the middle of the green to take advantage of the right to left slope for a left side pin placement, and be sure to use enough club. Big drives will carry creek on left side. Fairway wood and long iron will leave you in good position on the right side. Just don't get caught in the middle.